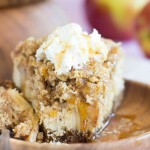 Apple crisp baked into a creamy and rich cheesecake. 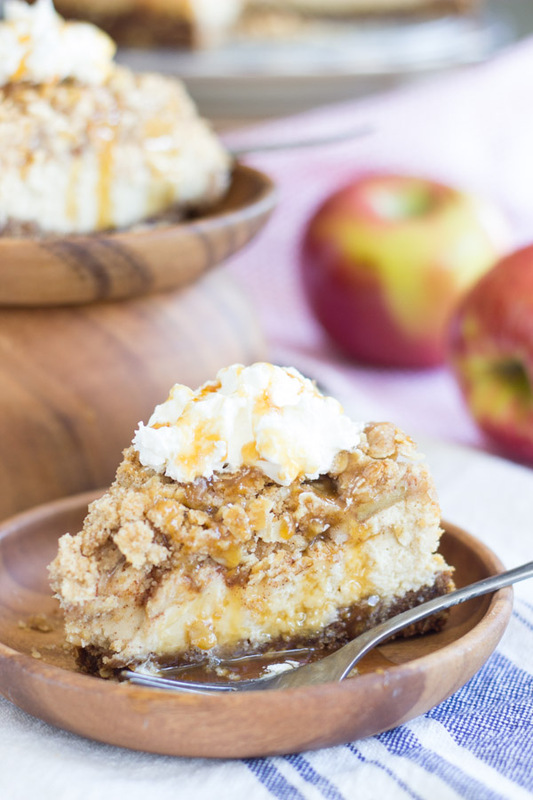 With an oatmeal cookie crust, rich cheesecake filling topped with sweet, cinnamony apples, and a boatload of oat streusel on top, this Caramel Apple Crisp Cheesecake is to-die-for! You’ll adore it. Top this Caramel Apple Crisp Cheesecake with a scoop of ice cream and drizzle of caramel sauce for the ultimate caramel apple crisp cheesecake. I made four (4!) 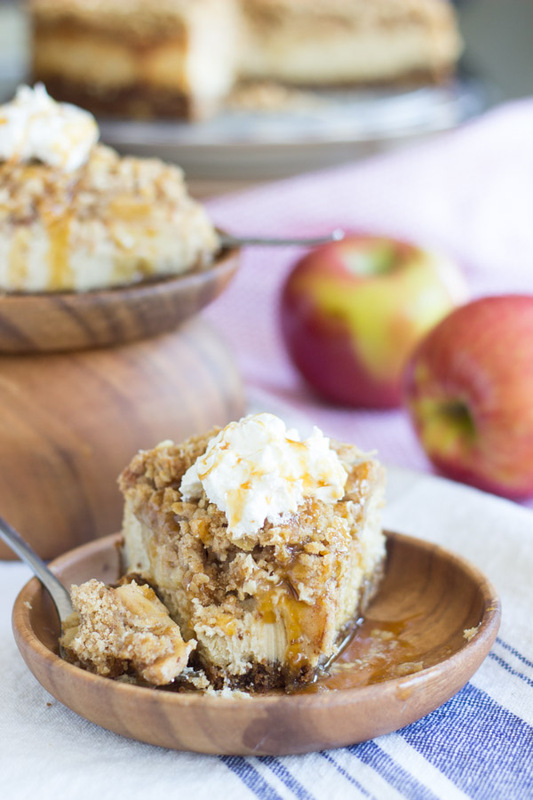 ‘fall’ cheesecakes, and this Caramel Apple Crisp Cheesecake is my personal favorite. I love all of them, or you wouldn’t see them on the blog, but this one is my personal favorite. The others are awesome too though. This White Chocolate Pumpkin Cheesecake with Gingersnap Crust that I posted last week is great because I always love any form of pumpkin cheesecake, but I think I’m just currently most proud of this Caramel Apple Crisp Cheesecake, and that’s why I’m partial to it. 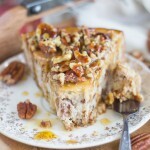 The Maple Nut Cheesecake with Walnut Crust and Honey Pecan Cheesecake with Pecan Shortbread Crust are also top-notch and fabulous. It’s the idea. 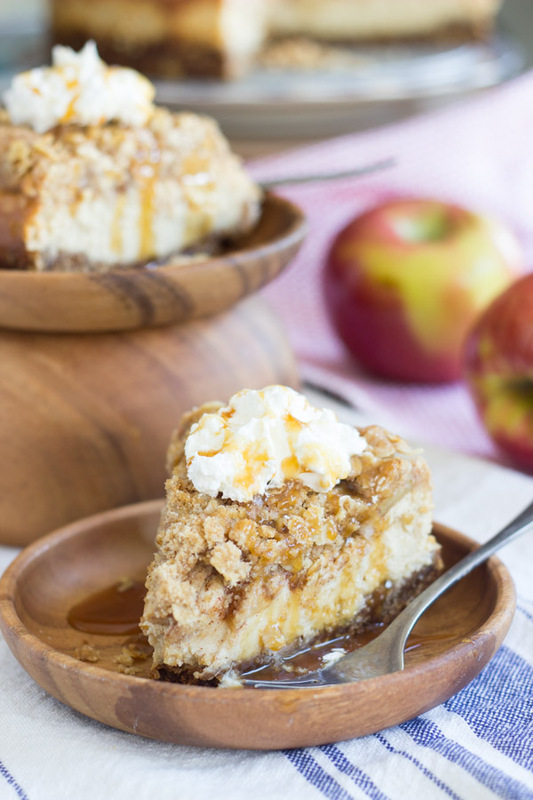 I loved the idea of this Caramel Apple Crisp Cheesecake, and was proud to have thought of it. It was original and creative. And when I executed it, the cheesecake turned out even better than I hoped. This Caramel Apple Crisp Cheesecake is my favorite in terms of originality, but the taste also cannot be beat. It’s not at all complex to make either. If you can handle a regular cheesecake, then you can easily make this one. Cheesecakes are not a lot of work in the first place – they just seem like they would be. This one is just as easy. 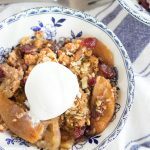 When I think of apple crisp, of course I think of oatmeal streusel. I wanted to carry that theme into the crust too, and not just the topping, so the crust is made with crushed oatmeal cookies. Oatmeal cookie crumbs!! Plus sugar and butter. Easy peasy. Just like making any other cheesecake crust, but more flavorful than graham crackers, for sure. The cheesecake layer should be no surprise – it’s the same basic cheesecake recipe that I use for almost all my cheesecakes. The only change is that I added caramel extract in the batter to give it extra caramel flair. Flair? Or flare? I go back and forth on this. My brother will likely correct me if I’m wrong (where you at, Jeff?). Anyway, the caramel extract isn’t necessary, but recommended! Next is a layer of cinnamon-sugar coated fresh apple slices, and a buttery, brown sugar oat-streusel. 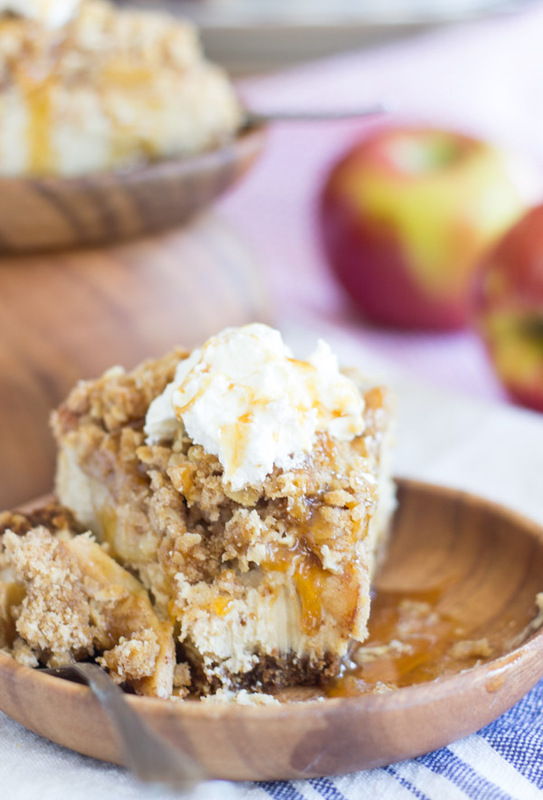 Basically, you bake apple crisp on top of a cheesecake. And then you douse it in caramel sauce. 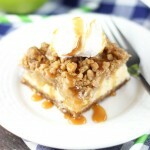 It’s exactly as the name would suggest, a Caramel Apple Crisp Cheesecake. 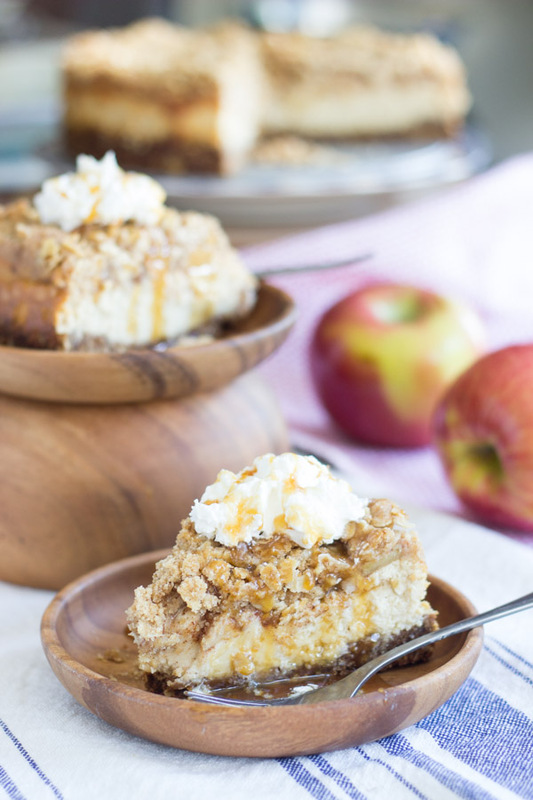 Combining two very different desserts, apple crisp and cheesecake, couldn’t be easier. Astonishingly. You just bake the one on top of the other. Who knew it would work out so perfectly like that? But it does. The cinnamon-sugar apples become soft, juicy, sweet, and gooey. The oatmeal streusel topping is a little crispy, sweet, and buttery, and the oats are toasty. Oatmeal streusel is such ordinary ingredients, but they come together for something extraordinary when they are combined and baked. It’s just like the best apple crisp baked on the best creamy cheesecake, and topped with ice cream and caramel sauce. All those things are great on their own, but the whole is much greater than the sum of its parts, and this Caramel Apple Crisp Cheesecake exemplifies that. 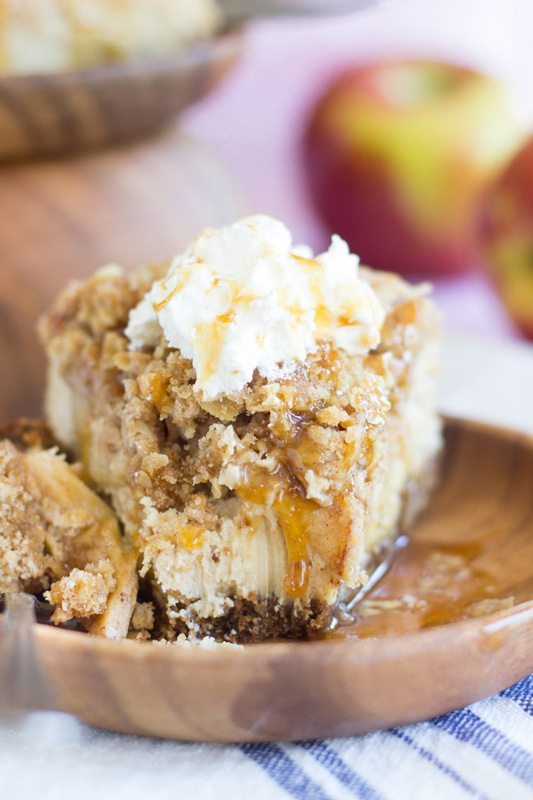 Apple crisp baked into a creamy and rich cheesecake! 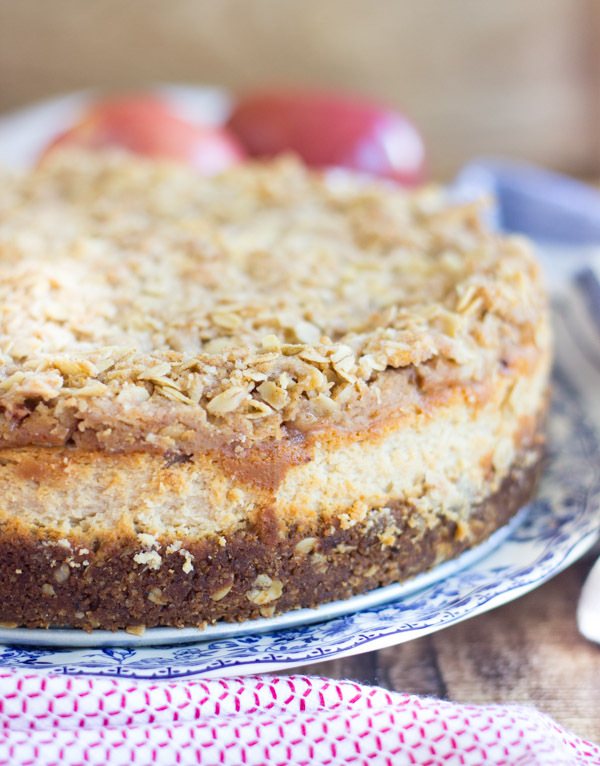 With an oatmeal cookie crust, rich cheesecake filling topped with sweet, cinnamony apples, and a boatload of oat streusel on top! In a small bowl, combine oatmeal cookie crumbs, oats, sugar, and butter. Press into the bottom of an 9-inch springform pan. Beat in vanilla and caramel extract. In a medium bowl, combine apples, cinnamon, and sugar, tossing to coat. Sprinkle it evenly over the apple layer, working from the edges to the center. Bake at 325 degrees for 65-75 minutes (it will take a while - it's very thick), or until the center appears set when jiggled. Serve with ice cream and caramel sauce. Okay…who EATS all of these amazing cheesecakes that you make? I cannot believe the beautiful desserts that you pump out of your kitchen on a regular basis. You are amazing! I love this idea and it looks like you executed it beautifully. I can see why it’s your favorite! 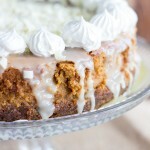 This is the Queen of all fall desserts. I mean, caramel and apple and crispy crumble AND cheesecake!? Amazing. I’m in love! Me too!! 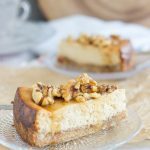 It’s my favorite fall cheesecake, for sure! It was soooooooo good. Thank you so much, Karly! This looks awesome! Pinning and may be trying later! Thanks for sharing on Family Joy Blog Link-up. Please come back and join us again! Remember to leave your host a comment to increase the chance of being featured. Thanks, Charlotte! So glad you like it. Thank you for the party! This looks amazing. I’m going to add it to my fall to-make list. Thanks for joining the Family Joy Link Party! Yikes! I am swooning over this cheesecake! Wonderful! Oooooh my goodness. Totally drooling! Do you have any springform pan size? Or do you have a 9-inch square pan? You could substitute that. I would make sure to line the pan with foil or parchment so that the cheesecake is easier to remove. A springform pan is helpful for this. Without it, I would line the pan with foil or parchment. Question: why would you leave a 2 star rating for a recipe you have not tried? I answered your question as quickly as possible!